Writing an eye-catching, mind-blowing, job-giving pharmacist resume can be a real pill. And we're here to help. You’ve given at least six years of your life to get your pharmacy degree. You’ve spent thousands of dollars on your education. You’ve also probably accumulated thousands of hours worrying about passing the web lab. And it all comes down to a piece of paper, your pharmacy resume. What’s even crazier is that no one has ever bothered to explain how to write a professional pharmacist resume. Stress no more my friend. You can put away that clonazepam, we got you! A pharmacist resume example better than 9 out of 10 other resumes. How to write a pharmacy resume that will land you more interviews. Tips and examples of how to put skills and achievements on a pharmacist resume. How to describe your experience on a resume for a pharmacist to get any job you want. Here's a sample resume for a pharmacist made using our resume builder. Pharmacist Resume Example - See +20 resume templates and create your resume here. What’s the Best Format for a Pharmacist Resume? Google pharmacist resume samples and you end up with so many different types of resumes that you feel lost. They all look so different… How do you even get started? How do you choose the best format for a pharmacist resume to get ahead of your competition? Our prescription for you? The reverse-chronological resume format. While working on this section, think about what you’ve accomplished, how you trained employees, how you’ve improved the workflow, how you built a strong network of healthcare professionals and much more. Because being a pharmacist is not as easy as it may look. Doctors count on you to carry out their prescriptions accurately and avoid any adverse drug interactions. Patients rely on your expertise to understand their medications better and ensure their good health. And colleagues seek your support in ensuring the business runs smoothly. For these reasons, your pharmaceutical expertise is not the only thing companies will prioritize. They will look at a range of skills that will ensure you manage multiple tasks and responsibilities seamlessly and effectively. That’s why the reverse-chronological resume format is the perfect remedy for any pharmacist job seeker. It shows off your experience while highlighting your skills. Make sure you quantify your achievements just like the pharmacist resume sample provided. Emphasizing your pharmacist skills is also a great strategy for anyone looking to shift from retail pharmacy to clinical pharmacy and vice-versa. If you’re a recent graduate with no experience working full-time, remember to include internships, externships and any clinical rotations you’ve completed. Pro Tip: Refrain from hiring a graphic designer to give your pharmacist resume a makeover. Overly designed resumes will be illegible to the robot scanners. Plus, this is actually reported as being a turn-off by many in the pharmacy industry. How to Write A Resume Summary or Resume Objective? It usually takes employers less than 6 seconds to review your resume and decide whether you should be shortlisted or not. No pressure! This also means that you should spend some time on the first ⅓ of your resume. Indeed, the best pharmacist resume is one that catches the eye of recruiters and encourages them to read it with as much attention as when you are reading your prescriptions. So should you use a pharmacist resume summary or a resume objective? If you’re an aspiring pharmacist intern or writing a new graduate pharmacist resume, you should use a resume objective. So should anyone seeking a new industry change. Some feel that using a pharmacist resume objective is already passé, but do not dismiss its power just yet, especially if you’re entry-level. It will help your profile get through the proper channels. Just keep in mind that you’re not writing a letter to Santa. It’s all about what the recruiter wants! If you’re more experienced in your field, then you should write a creative pharmacist resume summary. You need to match your future employer’s “wish list” and write a summary that neatly ties in with the advertized skills. Self-motivated pharmacy graduate with experience in community pharmacy and a talent for customer service. Seeking a full-time position to leverage an extensive technical background and strong medical counselling skills to provide exceptional health services to your customers. Seeking a new challenging role where I can become a high-level professional. Experienced retail pharmacist with 8+ years growing revenue for CVS. Seeking to leverage leadership and customer expertise for Walgreens. Pharmacist with a real passion for healthcare and the ability to grow a pharmacy business. Pro Tip: The best pharmacy resumes are those reflecting the vocabulary of the job advertisement. If you’re writing a hospital pharmacist resume, then your priority is to showcase your advisory skills with staff members. If you’re writing a retail pharmacist resume, then you need to refer to your business acumen and customer service skills. How to Describe Your Pharmacist Experience on a Resume? Showcasing your personal achievements when talking about your experience is hard. Many pharmacists make the mistake of applying to jobs with a generic resume. But you know better. In fact, you deserve better. Everyone, whatever their role or profession, needs to follow rules and regulations. Does it mean you have to write it on your resume? It’s a given requirement of being a pharmacist. Just like “being results-driven”, “hard-working” or a “team player”. This can be applied to everyone and adds no value to your resume. Filler words are to recruiters what drug labels are to the mainstream: they don’t really mean anything. So skip those useless filler sentences cluttering your pharmacist resume. Instead, focus on the good stuff. Keep it short, and sweet! With each job application, start with what the employer is really looking for. Then list your responsibilities and the results you’ve achieved. Responsibilities are common to every pharmacist out there. Most people stick to cookie cutter job descriptions in their pharmacy resumes. You need results to set you apart from the competition. No pharmacy will turn down a few extra bucks. This highlights your leadership skills. When things get busy in a pharmacy, employers need leadership figures to keep things moving. The second part of this sentence is where the genius is. Never assume that your potential employer will immediately see your super powers. You’re not on Nuvigil after all! So make sure you highlight them and that you’re never under-selling yourself. That’s exactly how you show off about your accomplishments in your pharmacist resume. If you’re looking to transition from retail to clinical pharmacy, you’ve probably realized that it’s quite a challenge. The transition starts with your resume. No surprise — resumes for pharmacy jobs aren’t all the same. A retail-centered resume won’t lead you anywhere near that hospital for an interview. Instead of focusing on how many sales you performed, highlight your ability to assess patient profiles for proper dosing. If you’ve only recently left school, focus on your clinical rotations. Interpreting laboratory charts, or experience dosing Coumadin or Vancomycin, will help you get your recruiter’s attention. Add clinically relevant skills. Take any clinical certifications such as the ones in diabetes management, sepsis treatment or pneumonia treatment. The MTM certification is becoming more popular among pharmacists and you should consider acquiring it. Leverage your thirst for clinical knowledge to make up for your retail background. Be flexible. Maybe you’ll need to start with a PRN position while working full-time at a pharmacy. Many PRN positions transition to full-time. Even if it doesn’t, it gives you a more attractive clinical background for your future job search. Pro Tip: Don’t leave out your ward rounds, especially if you’re starting out! Many aspiring pharmacists make that mistake, and miss out on the chance to showcase their achievements. Completing a degree in Pharmacy is necessary. Continuing education is also required for you to be able to renew your license to practice. One of the key takeaways from this guide is to understand and emphasize your own assets and skills. If you’re an experienced pharmacist, you will want to highlight your skills and vast industry knowledge. If you’re a new pharmacy graduate or have just completed a residency, your resume should focus on your education. This is an interview-landing strategy. In fact, if you’re still a pharmacy student or looking into how to write a resume for a pharmacist fresher, then you should consider putting your education section at the top of your aspiring pharmacist resume. The type of degree you received. Recruiters won’t care about where you went to high-school. Whether or where you did your pre-pharmacy is another story. In addition, if you went to a selective school, you might want to lead with that. Experienced job hunters can simply list their school, degree, and dates. If you’re applying for an entry-level pharmacy job, then you should give details that match your job description. If you’ve taken any other relevant coursework outside of pharmacy (eg. Business) then you should highlight it. Pro Tip: GPA is optional. You should only add it if you graduated within the last three years and if it was above a 3.0 (above a 3.5, ideally!) Otherwise, most hiring managers won’t really care. Your skills section is considered the clincher. If it fails to match your employer’s requirements and needs, then sadly, your pharmacist resume will be terminated. Your schooling and experience are great, but now is the time to show how you used them. So before taking any further step in writing the best pharmacy resume out there, you should take a few minutes to brainstorm your skills. Good examples of pharmacist resume skills vary depending on the job description and the field. Computer skills and technical skills are not exactly the same thing. Many hospitals and pharmacies are switching to digital records only, and being familiar with certain software and systems (such as PharmaSys) will give you an advantage. This list is far from exhaustive. It should act as a roadmap to help you enumerate the right skills that are needed in your field. Your next step is to put that in your pharmacist resume. Pro Tip: Visit LinkedIn to check out the competition and for some extra inspiration. Why would you snoop on other professionals? Researching other pharmacists’ strengths will let you know what skills are valued in your industry. The medical field is an ever-advancing industry and companies are always looking for employees up-to-date with the recent changes in pharmacy. Other than acquiring the right licences to practice, you have to be able to showcase a few certifications to wow your recruiter or show your expertise in a certain specialty. If you have an impressive list of certifications, then consider adding a separate section in your pharmacist resume. Otherwise, add certifications to your “education” section. If you’re looking to get a job in a very specialized field in pharmacy, such as nuclear pharmacy, then adding your certification is not only an edge over other applicants, but is considered mandatory. Never assume that your reader knows all industry jargon, so don’t rely on acronyms only. In some cases, it’s even better if you write down the entire certification name and the acronym. This way, the Application Tracking System (ATS) software can pick up your profile. Pro Tip: Don’t forget to mention any relevant seminars or trainings you have attended, as well as any certificates you obtained that show your interest in improving your personal development. If you don’t have that many, consider completing some online. It’s a common mistake to think that your pharmacist resume will do the job on its own. Cover letters are to a resume what a spoon is to syrup. Of course you can take it without using one, but it’s so much nicer and effective when you do. Again, don’t hesitate to snoop around online and on LinkedIn to find out who’s going to read your pharmacist job application. Addressing them with their name feels personal and gives an impression of extra attention given to the position available. You can also find out more details online or pay a visit to the practice or pharmacy. Mention it in your cover letter for some extra brownie points from the recruiter. Pro Tip: Don’t regurgitate your resume. The pharmacist cover letter is your chance to have a personal discussion with your recruiter. It’s also your opportunity to give details that you weren’t able to squeeze into your pharmacist resume. So tell the story of why you’re a perfect fit for the company. Define and emphasize your greatest assets. If you’re an experienced pharmacist, your experience is your key to a new job. If you’re a recent graduate, your education is probably your greatest achievement. Keep it relevant. Your pharmacist resume should target the field you’re interested in. Don’t distract recruiters with irrelevant experience. Add skills. Your pharmacist resume won’t be as powerful without it. Quantify your results and experience. Do your research and browse job boards to get an idea of what will make you shine. Do you have any questions on how to make a pharmacist resume? Get in touch in the comments section! 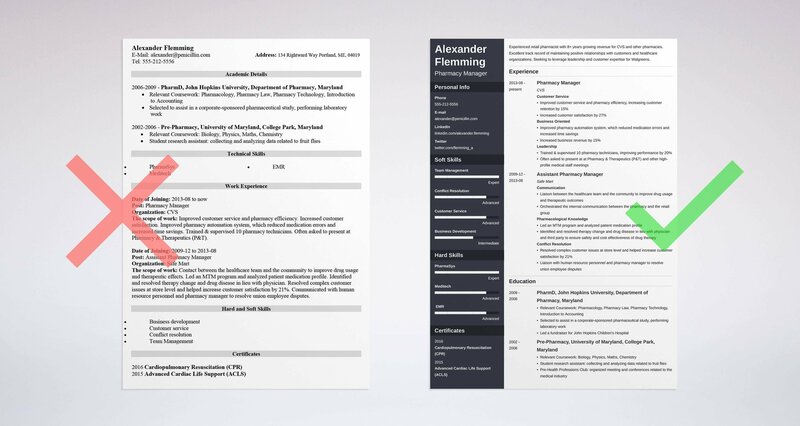 Looking for the best resume templates? Our great resume templates are perfect for writing your CV. Don't settle for good when you can have the best resume.